Burt Lancaster and Lee Marvin headline this rip-roaring Western action/adventure. 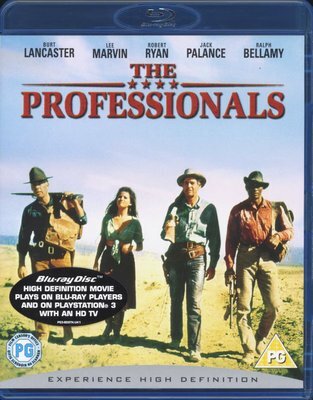 Four soldiers of fortune are hired by a wealthy Texan oil baron (Ralph Bellamy) to rescue his kidnapped wife (Claudia Cardinale), who's been spirited across the Mexican border by a band of mercenaries led by Jesus Raza (Jack Palance). The four rugged professionals, each regarded as a specialist in his selected field - an expert marksman and tracker (Woody Strode), the explosives master (Lancaster), horse handler (Robert Ryan) and one skilled in tactics and weaponry (Marvin) - make their way across the treacherous landscape to retrieve the beautiful kidnappee, but discover all is not what it seems in the explosive climax.